Having scooped the Gold Boy award in 2017, PSG superstar Kylian Mbappe is favourite to win it back-to-back. KYLIAN MBAPPE COULD become the first player to secure the Golden Boy award twice after he was included on a 40-man shortlist for this year’s prize. The Paris Saint-Germain forward was crowned in 2017 and has since played a starring role for France at the World Cup, scoring in the final against Croatia to help Les Bleus lift the trophy in Russia. 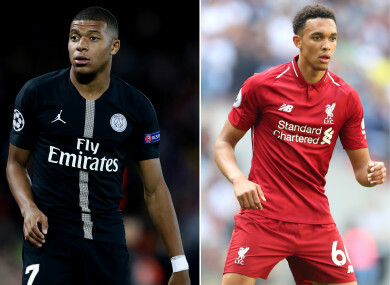 Liverpool full-back Trent Alexander-Arnold, who helped his club reach the Champions League final, is one of four from the Premier League in the running to be crowned the best young player under the age of 21. Manchester City’s Phil Foden and Everton’s Tom Davies have been selected too, along with Diogo Dalot, the Portuguese full-back who signed for Manchester United from Porto in June. Real Madrid new boy Vinicius Junior, Borussia Dortmund’s Christian Pulisic and Netherlands winger Justin Kluivert — who moved from Ajax to Roma in the last transfer window — are also in contention. Established by Italian newspaper Tuttosport, the award is voted for by a jury made up of journalists from across Europe. Previous winners include Mbappe’s compatriots Anthony Martial and Paul Pogba, while Lionel Messi won in it in 2005. Email “Liverpool defender Alexander-Arnold makes shortlist for best young footballer in the world prize”. Feedback on “Liverpool defender Alexander-Arnold makes shortlist for best young footballer in the world prize”.